Sarah shared some of her summer toy essentials last week. I'm excited to share some of my family's summer favorites this week. We usually split our time in the summer between California and Colorado, visiting with family and spending as much time outside as we can. One of my favorite things to do is to with my kids during the summer is go on adventures. These can be anywhere, on a walk around the block, at the park, at the beach, hiking. There are things to discover everywhere. As a parent, it's part of my job to help them see the extraordinary in the routine. It doesn't take much nudging (or often any at all), but here a few of my favorite essentials to help turn that walk around the block into an expedition. 1. This is one of my son's favorite things to tote around on our walks around the park. Sometimes we decide in advance what we're looking for, a specific type of bug or worm or rock, and he studies the plants and grass through the magnifying glass to find it. 2. I'm excited to introduce this to my kid's this summer and use it as a way to record and inspire new adventures. 3. My kids love to look at maps and give me directions, wherever we are or wherever we're headed, there's a good chance they have somewhere else in mind and I find the directions they give with a compass in hand have an extra air of authority. 4. This is just a fun tool for slightly longer hikes or camping. Compass, whistle, mirror, container, and more all in your hand. And it's hard to go wrong with a $5 price tag. 5. No matter where you're going, hydration is important, especially in the summer heat. 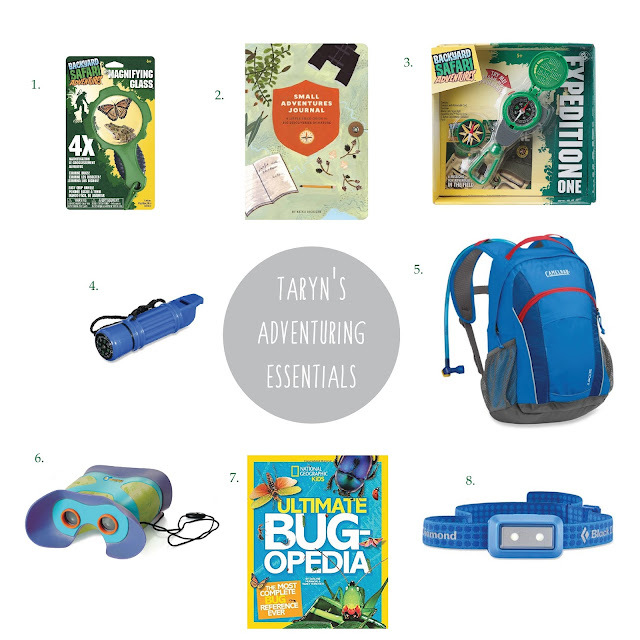 This is a great pack, the perfect size for little adventurers. 6. Every kid loves to play with these, they're a great toy at home and even more fun on hiking. It helps my little ones to see beyond where we're at and look at where we're trying to go. 7. National Geographic has some absolutely fantastic books for children. Their "First Big Books" series is great and this is a great resource to turn to before heading out to catch or study bugs. 8. And why limit your adventures to the day time? Night hiking or camping, headlamps are essential gear for young ones out past the sun.